The Canon EOS 80D takes almost everything that was missing or not quite up to scratch in the already impressive 70D and sets it right. Save for a second SD card slot and absence of 4K video there's not a whole lot missing in this mid-range master. The 80D is worth every penny and keeps the DSLR hugely relevant in today's market. If you're looking to drop a four-figure wedge of cash of a mid-range DSLR - one that'll last you for a good stretch of time - then Canon is one of the names that so often floats to the surface; the crema on the coffee, if you will. And in the 80D that layer of pro-made goodness is more pronounced than ever before, thanks to an autofocus system hike and viewfinder improvements. It's a necessary boost too, given the release of the 750D and 760D mixing up the company's DSLR pot and, in our view, muddying the waters. Now in the 80D there's clearer differentiation between the ranges; this mid-ranger pulls in a 45-point autofocus system, adapted from the 1D MkIV's, and, finally, achieves a what-you-see-is-what-you-get 100 per cent field-of-view optical viewfinder. It's enough to make you think twice about the Nikon D7200 (which is probably due an imminent update anyway). Given the strength of other cameras out there, though - including compact system cameras such as the Panasonic Lumix GH4 - is the EOS 80D the mid-range meddler to push its competition aside? We've had one in tow for a week to see. Perhaps the most obvious place to start with the 80D is its autofocus system. When the 1D MkIV was originally launched you'd have to spend around £4,000 on that camera body. Now, in 2016, that technology is a quarter of the price in 80D form. It's actually better in many regards thanks to software tweaks and heightened sensitivity. Not bad, eh? Capable of low-light focus to -3EV - the same as you'll find in the EOS 6D full-frame model - and comprising 45 autofocus points, all of which are cross-type (27 of them are sensitive to f/8, nine of which are cross-type sensitive to ensure heightened sensitivity if you're using, say, a slower lens or zoom extender) meaning there's a lot of clout here. For this review we've had the 24-70mm f/4.0 lens attached to the camera for the duration, so our results are, in part, subject to the characteristics of this lens. There are a wealth of other optics available in the EF/EF-S ranges, of course, which cost varying degree of cash (the real achiever is the f/2.8 L-series version of the 24-70mm). But even with this optic choice, we've been largely impressed with the results, whether using single- or continuous-autofocus. It's really quick in operation. We'll stick our necks out and say we can't think of a better focus tracking system at this level when set to continuous autofocus - it just seems to grip ahold of a subject and follow with plenty of AF-point feedback. There are four autofocus modes, breaking the 45-points option down into 1-point, small and large zone selections as suited to your subject; toggling between the four modes is easily actioned by pressing the button to the side of the front thumbwheel. If anything it's the 1-point mode, which when used positioned off-centre (as we have been for some still shots), that presents some issues. In a mixture of lighting conditions sometimes it just refused to provide that light-up red AF point illumination feedback. We repeatedly shot a flower at full zoom, for example, but failed to perfectly hit focus. And there's no pinpoint focus mode as per the Panasonic GH4, for example, to help doubly confirm focus acquisition. Comparing to a compact system camera is an interesting point, as the 80D's autofocus isn't solely based on viewfinder use. Just as there is with the top-tier 1D X MkII, the 80D also pushes Dual Pixel AF for super-fast live view performance. In the previous 70D this meant smooth and fast live view focusing, the likes of which, at the time, no other DSLR camera could compete against. In the 80D, with its vari-angle touchscreen incorporated, we've found it really handy to just tap the screen and obtain reliable focus quickly. It's not going to beat a compact system camera, but it's as good as DSLR cameras get. Which brings us neatly to the camera's design. Because it's full of desirable features that, more often than not, even top-spec pro DSLR cameras lack these days. We've already mentioned that vari-angle touchscreen, which sits on a bracket projecting from the camera's side. As this can swivel around through 360-degrees, at one angle or another, it's the perfect companion for a camera such as this - and preferable over a tilt-angle option, which can only move in a vertical motion. But it's the viewfinder that sees real change. With the 70D a 98 per cent field-of-view meant the outermost two per cent of the finder's frame couldn't be seen in composition (despite being captured in the image). Nikon has long held an advantage at this level, with its D7100/7200 offering 100 per cent, meaning what you see in the frame is what you get in the image. The 80D has risen to the challenge and ups the ante to a 100 per cent field-of-view (hence the added "bump on the head" in design compared to the 70D). The viewfinder also proclaims itself "intelligent": in a similar fashion to the 7D II's it's able to present an electronic level, grid display and focus feedback - including confirmatory red illumination in low-light conditions (but not in all conditions) - by using a screen overlay. This means non-permanent focus points don't disrupt the view, or you can toggle the grid/level on or off as you desire. However, the 80D's 0.63x viewfinder magnification isn't huge to the eye and we've noticed purple flare from some light sources which is annoying (and not present in images, just through the finder). 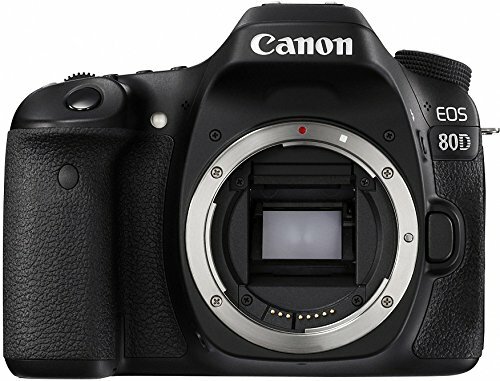 Elsewhere, and just as with the 70D, the 80D continues a weather-sealed construction, which is one of the specs that sets it above and beyond a lower-tier camera such as the EOS 760D. It's rugged and built to last, although you might not think so to look at: Canon does choose a strange-looking plasticky coating for this level of DSLR that just looks, well, budget. It's not, though, it's actually an "aluminium and polycarbonate resin with glass and conductive fibre" construct. Oh, er. Canon is now getting more comfortable with higher-resolution sensors too, the 80D embodying a 24.2-megapixel APS-C offering, pitching it squarely against Nikon's going resolution. But this resolution bump means the burst mode remains unchanged between 70D and 80D, offering 7fps maximum. However, the 80D can shoot more shots consecutively, maxing out at 110 JPEG shots or 25 raw files without pausing, so Canon says. In our burst test - using a UHS-I 45MB/sec max SD card - we snapped 17 raw & JPEG frames before the buffer had had enough. That's more than double what we managed with the 70D, so even though the speed hasn't increased beyond 7fps in the 80D, the buffer is more significant. None too shabby, albeit short of its quoted maximum in our use (different subjects and different cards may yield different results, but there's no UHS-II compatibility according to the specification). Still images are what the 80D is primed for - particularly noticeable as there's no 4K video in this model. And that new 24-megapixel sensor does an ace job when it comes to quality, producing images of a larger scale and, in our view, a better quality than the earlier 70D. That'll be the latest Digic 6 processor doing its thing. It's the higher ISO settings where the main difference can be seen. We've been back over our 70D shots from 2013 and find the 80D's at ISO 6400 are slightly less grainy with image noise less noticeable by comparison. Quirky musical notation on pub walls (shot at ISO 6400) is still clearly legible, despite some slight grain, while the detail in deep blacks of a sculptural mural (shot at ISO 3200) remain rich and clean. It's only the mid-greys where we've seen a slight ghostly appearance of colour noise, but it's barely noticeable. Just avoid the top-end ISO 25,600, which is pushing things to say the least. Not that you'll be shooting at the high ISO settings all the time, of course. And the base-level ISO 100 and other low sensitivities shots present plenty of detail and colour is faithful without being overbearing. It's fairly easy to over-expose shots with default settings - despite an upgrade to a 7560-pixel RGB+IR metering sensor compared to 63-zone dual-layer module of the 70D - but with exposure compensation and four types of metering available it's ultimately down to you as a photographer to get that right. Considering how well the 70D performed, the bump in both resolution and quality from the 80D helps it to raise the bar to a notable degree. Given the rest of the market, as APS-C sensors go, Canon has cemented itself as a contender for pole position here. Moving images aren't entirely negated, of course, with the camera capable of handing Full HD 1080p capture, including both a microphone and headphones sockets for the videographers out there. It's only the lack of 4K capture which sees some competitors, Panasonic GH4 included, offer more. It's here the touch-focus comes in handy too, with Canon's most advanced system yet. Auto face recognition can drive focus automatically, but can easily be over-ridden by tapping anywhere on the screen for a tracking AF point to follow a subject - which it does reasonably well. Again, the tracking point can be over-ridden too by half-pressing the shutter button to fix focus where the focus area is at that moment in time. Or you can disengage everything and go fully manual should you wish. There might be no 4K, but this is user-friendly one-man video capture capability. Canon is looking to progress video capture in other ways too. At preview stage the 80D we saw was paired with a brand new 18-135mm nano USM lens, designed with best-of-both fast action and movie shooting in mind. It incorporates an electrical connection port, to which the new PZ-E1 power zoom adapter (£129, due June) can be added to motor-drive the lens. It's an interesting idea for smooth focus, although the motor is rather noisy (you'll need to use external mics to negate that), but the smooth motion of the slow/fast toggle zoom control from this unit will speak volumes to certain movie shooters. The 18-135mm isn't a super-fast lens, but we strongly suspect this port will make an appearance on future Canon lenses too. Watch this space. The Canon EOS 80D takes almost everything that was missing or not quite up to scratch in the already impressive 70D and sets it right. Save for a second SD card slot and absence of 4K video there's not a whole lot missing in this mid-range master. A comprehensive autofocus system sets the standard for continuous autofocus at this level, while live view works a treat too as DSLR cameras go. We'd still like a pinpoint focus type mode and AF point illumination for focus conformation in all conditions, not just when it's dark. But even so, few competitors will keep up with the 80D's autofocus system. Plus there's finally a 100 per cent field-of-view optical viewfinder to go with that vari-angle touchscreen, ensuring Canon is competitive against its main Nikon competitor. All that and the images get a big thumbs up too. Capable throughout much of the ISO range, into the higher sensitivities, attach a quality lens to the front of this DSLR and it won't disappoint. Sure, it's not cheap all-in, but you already knew that. But know this: the 80D is worth every penny and keeps the DSLR hugely relevant in today's market.